Fri. July 13, 1-3pm — English and Welsh Parish Records 1538 -1837. Sat. Sept. 15, 1-3pm — English &Welsh Civil Registration: 1837 – Present. Liz Pearson is a native of England whose foray into genealogical research started about 35 years ago when an attempt to identify her grandmother turned into her very own family history addiction. Since then, she has spent thousands of hours combing the myriad English and Welsh archives in the UK, the US, and online for herself and others. Liz is an expert on ecumenical (1538-1837) and civil law (1837-Present) and the broad spectrum of Parish Chest Records. She holds several research qualifications and is an associate member of the Society of Genealogists in London, England. Liz now volunteers and teaches for the Pinellas (FL) Genealogical Society as well as offering professional genealogy services in English and Welsh family history. Liz is also a photographer and likes to spend her spare time capturing images of elusive wild orchids and uncooperative fauna. 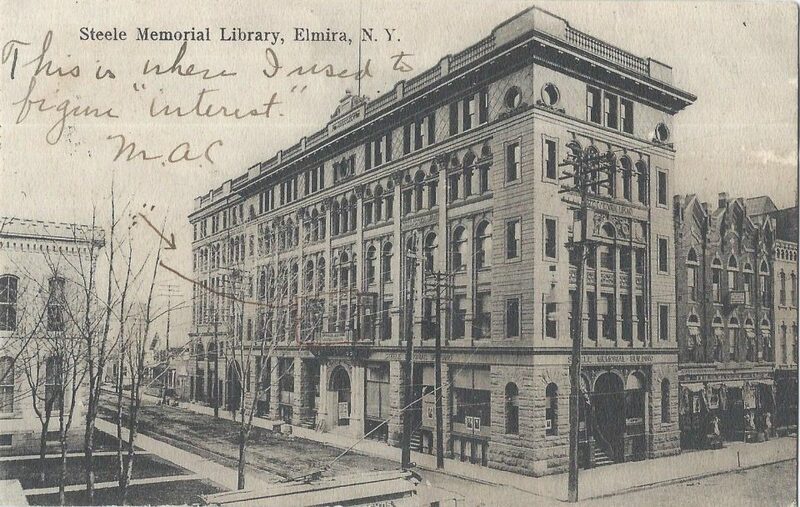 The Steele Memorial Library is located in downtown Elmira NY at 101. E Church St.
From I-86 (Route 17) take exit 56 for Elmira. Continue on 352 W (Church St) heading west. We are located at the intersection of Clemens Center Parkway and Church St. Parking entrances can be found off of church St, and off of 1st St via the Clemens Center Parkway. There is parking behind the library as well as by the entrances. The programs will be in the large meeting room of the Steele Memorial Library. The library is open until 5pm on Fridays and Saturdays. Program attendees are welcome to explore the genealogical holdings upstairs, and with ID, peruse ancestry.com on the library computers. Come early, stay late, and research! 1975-present. Accessible through the online library catalog. See Genealogy Department web page for instructions! Pepper Pot Café: 311 College Ave.
Beijing Gardens: 145 W. Gray St.
Los Panchos: 250 W. Water St. Turtle Leaf Café: 315 E. Water St.